Before Nick Carraway was drawn into Daisy and Gatsby's sparkling, champagne-fueled world in The Great Gatsby, F. Scott Fitzgerald vacationed in the French Riviera, where a small green lighthouse winked at ships on the horizon. Before the nameless lovers began their illicit affair in The Lover, Marguerite Duras embarked upon her own scandalous relationship amidst the urban streets of Saigon. And before readers were terrified by a tentacled dragon-man called Cthulhu, H.P. Lovecraft was enthralled by the Industrial Trust tower-the twenty-six-story skyscraper that makes up the skyline of Providence, Rhode Island. 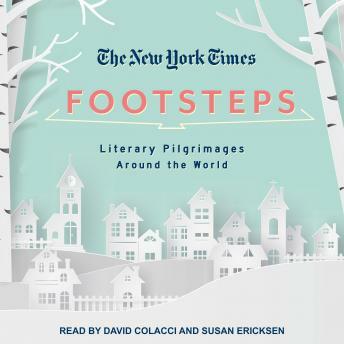 Based on the popular New York Times travel column, Footsteps is an anthology of literary pilgrimages, exploring the geographic muses behind some of history's greatest writers. From the 'dangerous, dirty and seductive' streets of Naples, the setting for Elena Ferrante's famous Neapolitan novels, to the 'stone arches, creaky oaken doors, and riverside paths' of Oxford, the backdrop for Alice's adventures in Wonderland, Footsteps takes a fresh approach to literary tourism, appealing to readers and travel enthusiasts alike.